Landscaper Gracie Desoto is too busy building her business to worry about her love life. Until she receives news her ex-husband is getting remarried, and she meets the enigmatic Ethan McCarthy. Despite the warning bells, Grace can’t deny her attraction to the much younger man. Ethan McCarthy is a man on the mission. His job keeps him on his toes, plus he’s dealing with personal issues he can’t figure out. He doesn’t have room in his life for a romance, until an encounter with the adorable Gracie changes his mind. In a whirlwind weekend of missing plants and a murder with Ethan as a possible suspect, Gracie is determined to solve the mystery and clear her man. Together, they head down a darkened path into an unknown where they may not survive. 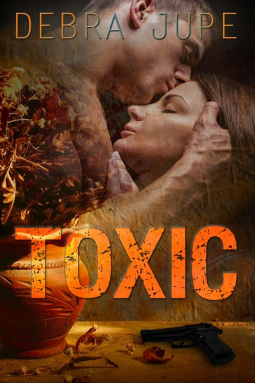 Is their love toxic, or is it worth the risk? I enjoyed this book a lot i just loved Gracie and Ethan you cannot help but like and root for these two they were wonderful characters and so good together. Gracie has no time for a relationship after her divorce she is all about building up her landscaping firm that is until she visits the nurdery where she used to work and meets Ethan,right from the start they have a love/hate relationship the more they see each other the hotter the chemistry between them becomes until they give in and spend the weekend together. As well as being a great romance you also get a murder mystery thrown in i really enjoyed this book i did not want to put it down a really great read. I'm not usually into romance suspense novels but this one was really freaking good. I loved the characters, Gracie and Ethan, they had so much depth to them. Great characters + a mystery, YES YES YES!